Recently, my dog Maeby and I filmed a spot with Rafferty Subaru, discussing the importance of car safety for our pets. With the advent of pet-friendly hotels everywhere, it seems more and more of us are traveling with our pets. Some dog owners like to take Fido everywhere, even while running brief errands around town, while others only take Fluffy or Fido in the car when absolutely necessary (like when coming to see me at Newtown Square Veterinary Hospital!) There are some basic safety considerations any time your fluffy companion is traveling with you. 1.) All pets in the car should be restrained at all times. I see so many people driving around town with small, fluffy dogs on their laps. This is a recipe for disaster. If you stop short and brake suddenly, Fiona may fly forward and hit the windshield. Any pet loose in the car can, in an accident, act as a projectile and cause serious injury to other people and pets in the car. 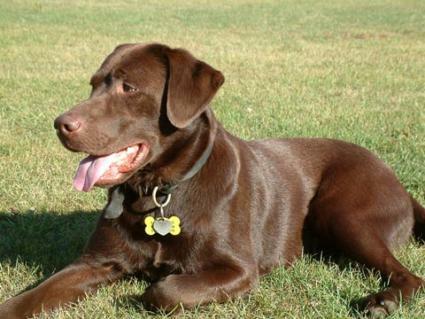 A 60 pound dog, in a car traveling 35 miles per hour, can exert 2,600 pounds of force in an accident. Large and medium-sized dogs should be strapped in the back seat with a harness, or secured in the trunk area with a crate. (And the crate should then be secured with a seat belt or other straps.) Smaller dogs can be restrained in the back seat with a crate or basket-style harness. Cats should always be in a crate, preferably with heavy padding in case they get tossed around; again, the crate should be secured with a seat belt. 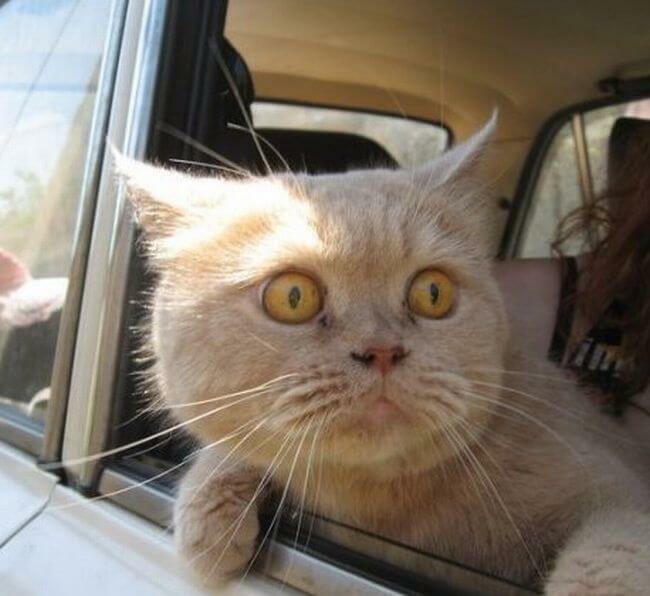 I’ve seen a cat, free range in the car, tunnel its way under the brake pedal and become lodged inside the inner workings of the center console! That’s not a good way to travel anywhere. Until recently, no pet seat belts had undergone safety or crash testing. 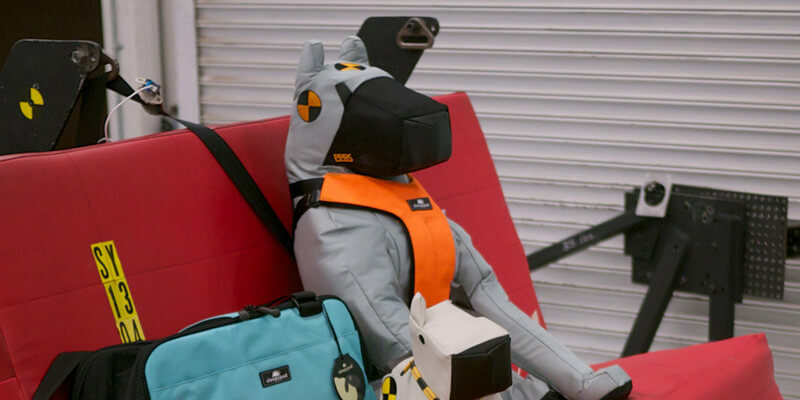 This summer, a nonprofit organization called the Center for Pet Safety (CPS) conducted rigorous crash tests with a variety of car harnesses, in partnership with Suburu. All harnesses except one, called the Sleepypod Clickit, failed the crash tests miserably. 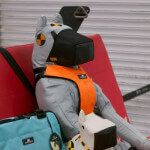 (Click here to see video of the crash test doggy used in these tests.) It’s alarming how poorly these travel harnesses fared in testing. CPS is currently developing manufacturing and safety standards, as well as testing protocols, for the pet products industry, which will hopefully result in safer pet restraint options. Subaru dealerships such as Rafferty Subaru will soon be making Sleepypod Clickit harnesses available for their customers, and they are also available for purchase directly through Sleepypod. 2.) Motion sickness is a common problem, particularly in puppies. 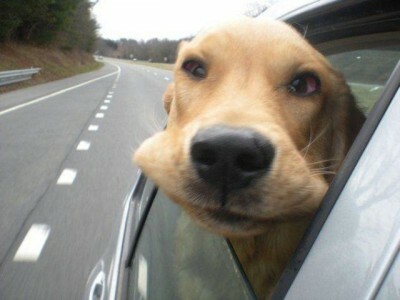 Most puppies with car sickness will outgrow it, but some never do. The easiest way to combat motion sickness is to withhold food prior to car travel; pets with an empty stomach are less likely to vomit. Desensitizing puppies and kittens to car travel is also important. Start by spending a moment or two in a parked car, in the driveway, with your pet secured as she will be when you drive. Then, get out of the car without driving anywhere. Do this several times, until your pet is comfortable with the routine. Then, start backing out of the driveway and making very small trips around the block. Stop the trip before Fido starts panting, acting agitated or salivating excessively. Gradually desensitizing Fido and Fluffy to the car can make travel, and trips to the vet, much less stressful for everyone! Finally, there are over-the-counter and prescription medications that can be used for severely motion sick pets; please ask your veterinarian for more information! 4.) 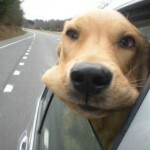 Some dogs who are anxious in the car may fare better with something to keep them “busy” during travel. Think rawhides, or a Kong stuffed with some peanut butter and kibble, provided these items won’t make Fido car sick. 5.) Our feline friends tend to travel far less than their canine counterparts. As a result, it can be difficult to convince Fluffy to get inside her carrier, and she may howl/scream/vomit/urinate/defecate during the entire trip. There are some ways to reduce Fluffy’s anxiety and make her trips out of the home less stressful. Especially for new kittens, it’s important to desensitize them to the carrier, so drive them around early and often! If you know a trip is forthcoming, leave Fluffy’s carrier out for several days prior to departure so she can acclimate to it. Using a product such as Feliway (a synthetic feline pheromone known to have a calming effect) in the carrier about 30 minutes before putting Fluffy in her carrier can reduce her anxiety significantly. 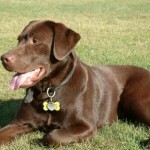 (A canine pheromone called Adaptil can be used similarly in dogs.) Finally, there is an anxiety collar (called NutureCalm) for cats, which you can put on Fluffy about 24 hours before your intended departure. This, combined with Feliway, can significantly mellow any stressed out traveling feline. 6.) On long trips, be sure to bring food and water, bowls, “refuse” bags for any deposits made at rest stops, paper towels and/or rags in case any clean up is needed. Don’t forget Fido’s leash and Fluffy’s favorite toy. Be sure to investigate the name and number of a 24-hour veterinary emergency center at your travel destination, just in case! Bon voyage.